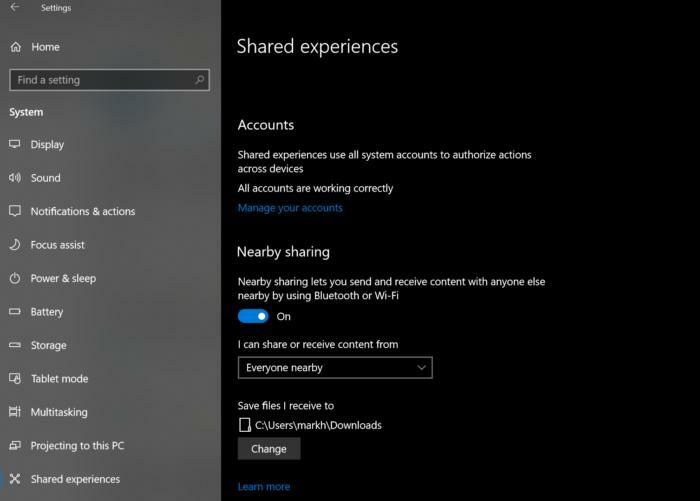 Microsoft is set to introduce a new feature in the spring 2018 feature update of Windows 10, AKA Redstone 4, called Near Share to allows users to share files wirelessly to other user on a different PC. It works the way Apple's AirDrop work for iOS devices, and it's pretty convenient to share those random stuff off the screen. Near Share was first introduced in Windows 10’s Insider Build 17035, as an ad-hoc replacement for the "sneakernet" of trading USB keys, and uses both Bluetooth and Wi-Fi (Bluetooth to establish and maintain the connection, and Wi-Fi to help transfer files). And PCs will need to be tied to the Insider program, or just be up-to-date with Windows 10 Redstone 4 when it drops to be able to beam files across via Near Share. The feature is turned off by default, Near Share, so to turn it on, you’ll need to open the Settings menu, specifically Settings > Home > System > Shared experiences. Toggle on the Nearby sharing button. The Share across devices setting, below it, enables the “Pick up where you left off” experiences that are built into the related Timeline features and Cortana. As per the permission settings, you can either allow any nearby device to send files across to you or limit the sending of files to your own, signed-in PCs. There’s a tip to consider in renaming your PCs, given that Windows assigns a quasi-random device name to each PC, so when you’re transferring a file, you’ll need to pick which PC to send it to, so a recognizable name is a no-brainer. The feature is more convenient than using a USB stick to share images or some small files, albeit it’s a limited use case that could have an enlarged scope. Microsoft, however plans to launch a “cloud clipboard” in the Redstone 5 release or later of Windows 10, due this fall.